It began, as all good road trips do, with drinks and dinner. My friend Tina was in Florida on business, and our conversation veered from books we were currently reading to beloved childhood books. The Little House books came up, followed by the Betsy-Tacy series, books that we both had read. “A trip to Mankato is on my bucket list,” I said. “I live an hour from Mankato,” Tina said. “Next summer, let’s do it.” About a year later, we were following the Laura Ingalls Wilder Historic Highway: U.S. Route 14, beginning in Pepin, Wisconsin, and ending in De Smet, South Dakota. Day One, Friday, June 13th. 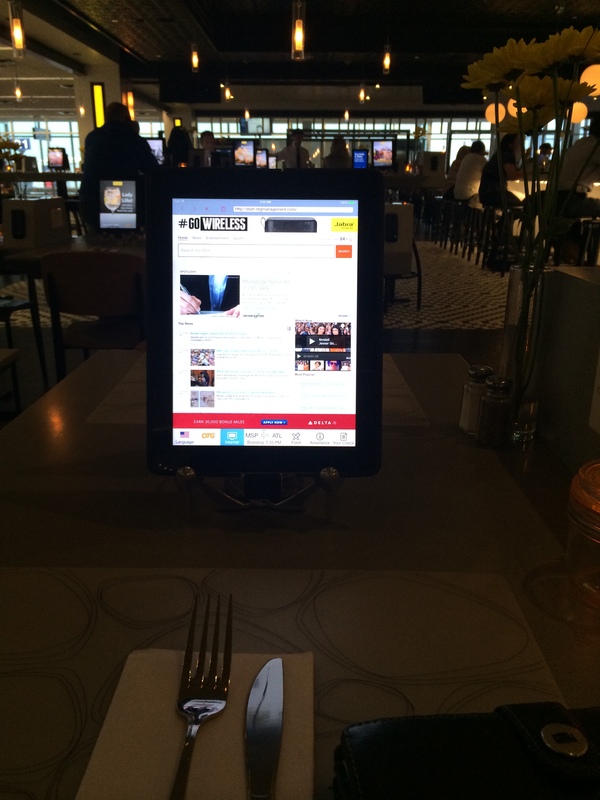 Minneapolis: I arrived in Minneapolis early that afternoon and checked into the Bloomington Courtyard by Marriott hotel, just a few minutes from the Mall of America. The shuttle driver told me to expect severe weather that weekend, but it was sunny and cool that afternoon. After some downtime, I went over to the mall. The Mall. Wow. People, lots of people, an aquarium, an amusement park. So many stores, so many Caribou Coffees. It overwhelmed me, and I found a quiet spot in Barnes and Noble to review the map and get my bearings. I slowly wandered the first floor, stopping to gawk at the indoor amusement park and to buy gifts for my kids. Later, Tina and I met up for more walking and dinner at Crave. I had the walleye, a local fish. Delicious. Day Two, Saturday, June 14. Minneapolis to Mankato: Tina picked me up at the hotel, and we hit the road by 8:00 AM. Our schedule was fairly tight: the Betsy-Tacy homes were only open from 1:00-3:00, and we wanted to visit the Big Woods site in Pepin, WI, first. We took the scenic roads that followed the Mississippi River from Minneapolis to Wisconsin. 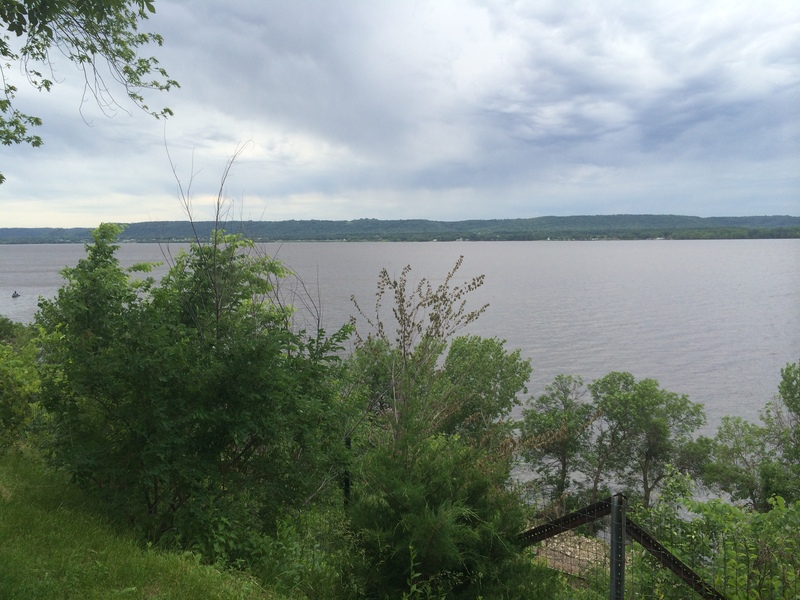 Fun fact: Lake Pepin is the widest spot on the Mississippi. The day was cool and overcast; rain threatened but didn’t hit until mid-afternoon. We reached Pepin, a charming village along the lake. 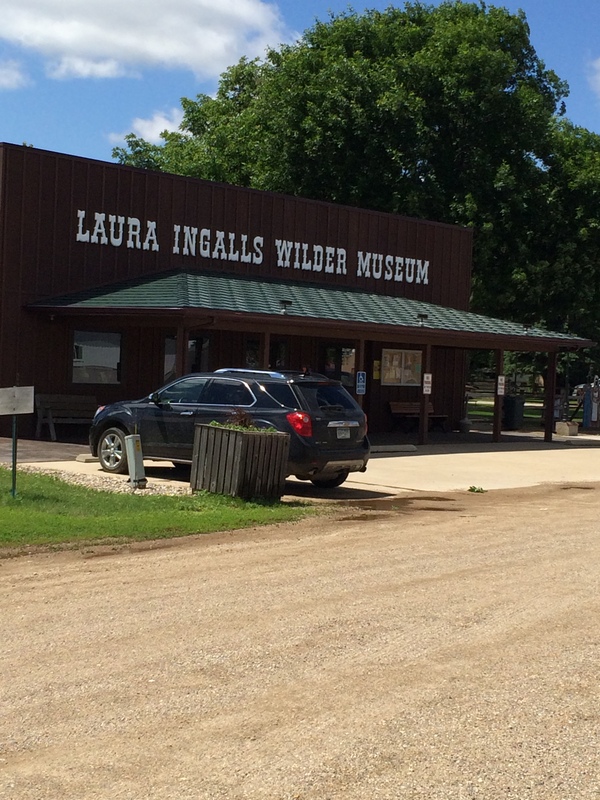 The Laura Ingalls Wilder Museum was closed when we arrived (as was the nearby winery), so we drove seven miles to the Ingalls’ homesite in the Big Woods. Now, it is rolling farmland, but here and there, one can see patches of thick woods and imagine Pa hunting a bear or panther. We walked around the rebuilt little house. Back in town, we visited the museum, which contained a few items belonging to Laura and her daughter Rose Wilder Lane. Most of the collection, the museum employee told us, is found at Laura’s home in Mansfield, Missouri. We left Pepin and drove to Rochester, Minnesota, where we picked up U.S. Route 14, which would take us west to Walnut Grove and then to De Smet. 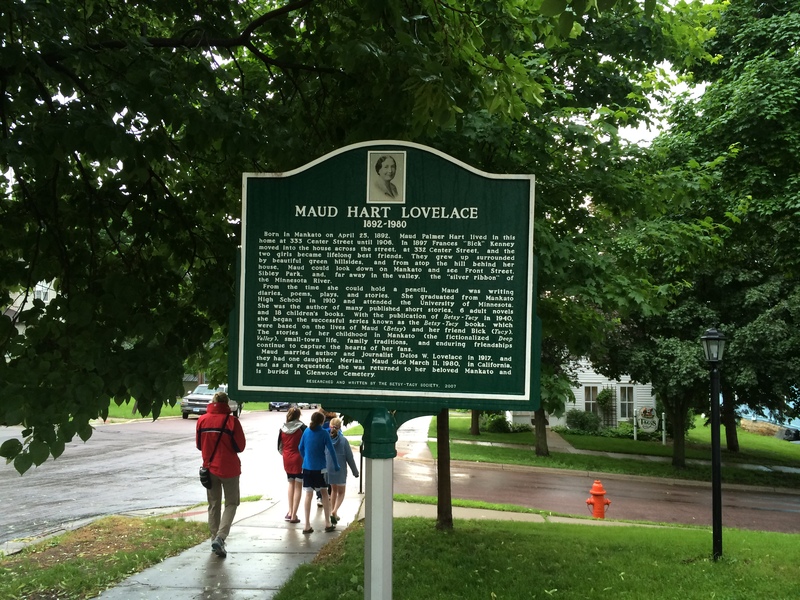 But, first, a stop along the way in Mankato, the fictional Deep Valley of Maud Hart Lovelace’s wonderful Betsy-Tacy series. We began the tour in Tacy’s home,the actual home of Bick Kenney, Maud Hart Lovelace’s real-life best friend. While waiting, we browsed the store and chatted with the volunteers. A group of mothers our age and their teenage daughters joined us for the tour; the mothers had read the books, but their daughters had not. Our tour guide brought us across the street to the Hart home (Betsy’s house), which was furnished with some original furniture along with pieces belonging to the Lovelaces (Maud and Delos). Each room had a sketch from the books to show the accuracy of Lois Lenski’s (the first four books’ illustrator) drawings. Our guide explained how the Betsy-Tacy Society used these illustrations during the restoration of the two homes. We finished off the afternoon at a local winery, followed by dinner, drinks, and live music at the NaKato in North Mankato. Day Three, Sunday, June 16. 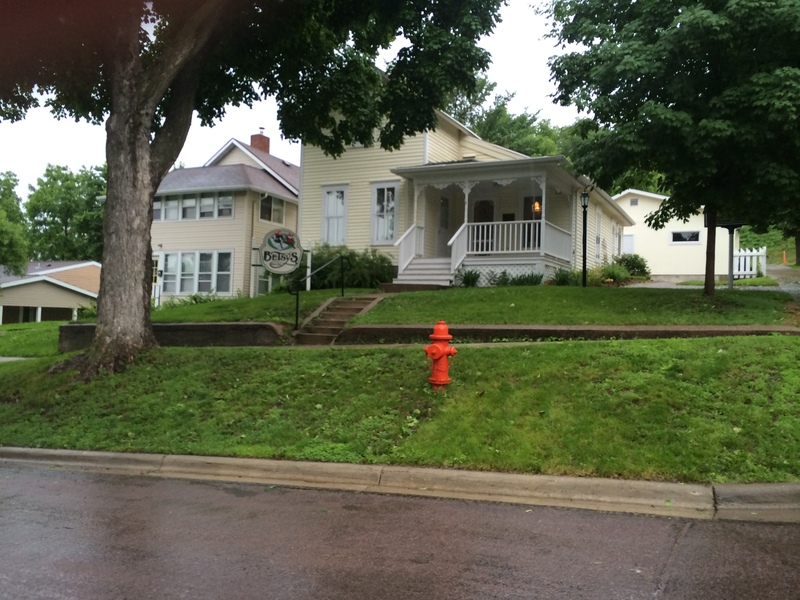 Mankato to De Smet: We awoke to rain and fog in Mankato and drove west to Walnut Grove, the setting for On the Banks of Plum Creek. The clouds lifted as we crossed the prairie, and by the time we reached Walnut Grove, the sun was shining and a good wind blew. 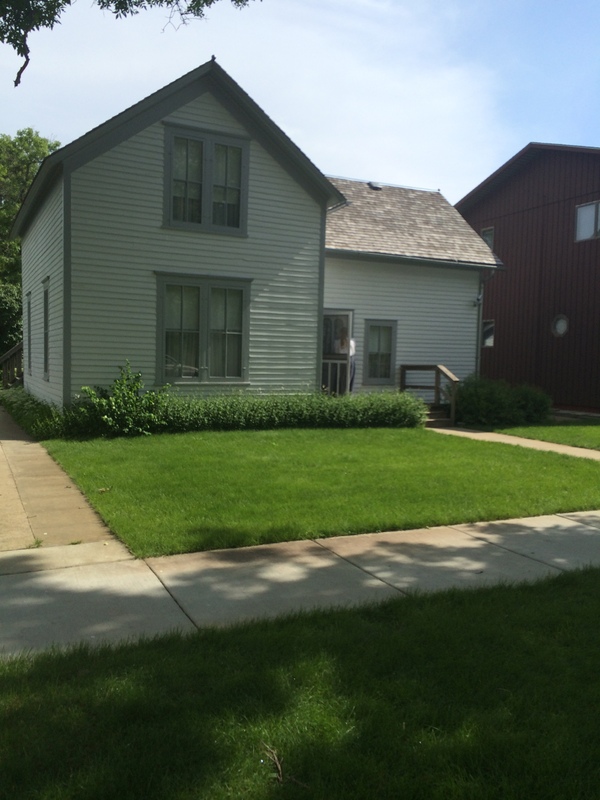 We stopped at the next Laura Ingalls Wilder Museum. Like the Pepin museum, this one had only a few items belonging to the Ingalls-Wilder families, but what it lacked in artifacts, it made up for with an excellent display documenting the family’s history and linking it to the events in the books. There was also a room devoted to “The Little House on the Prairie” television series. 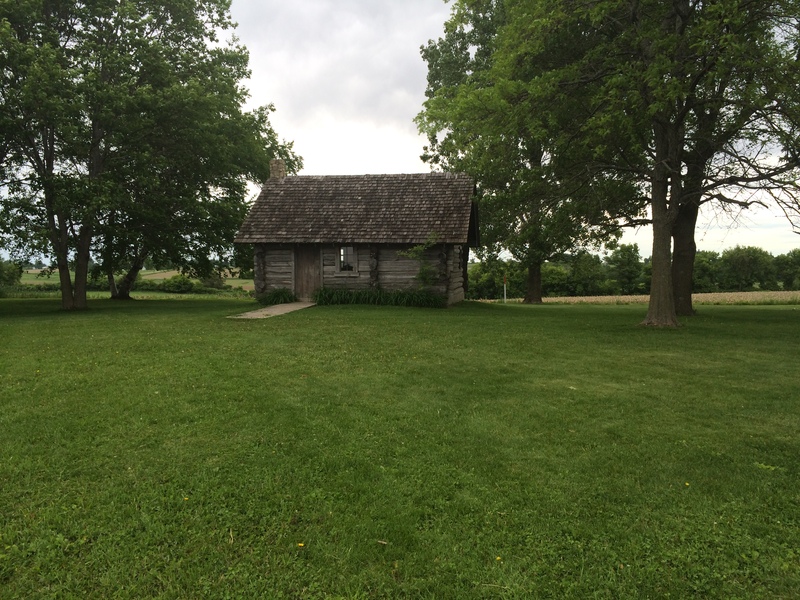 We left the main building and visited a sod house, a one-room school, and another small home from this time period (none of these structures were ever occupied by the Ingalls family). After an hour or so, we were ready to make like Pa and head west. Before leaving town, we stopped at Plum Creek to see the dugout site. 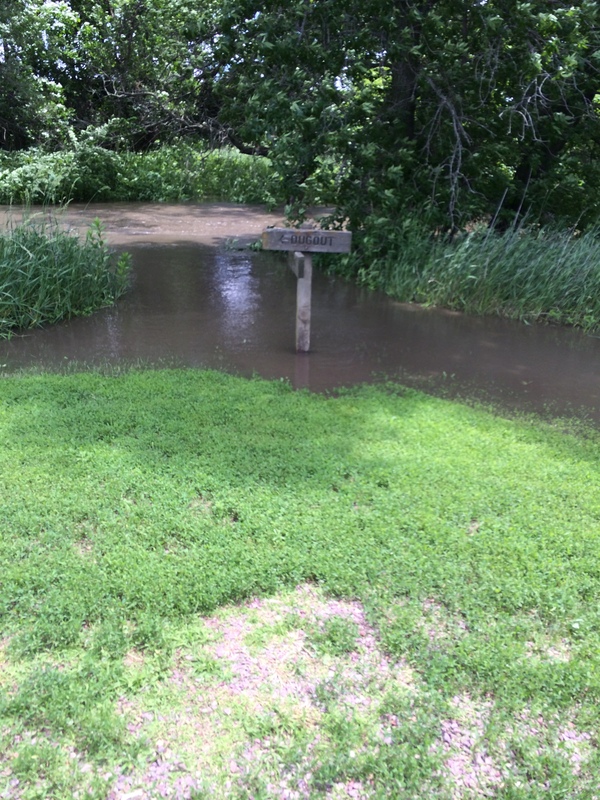 The creek was muddy and rising; the property owner drove out to shut down the site due to flooding. I recalled the scene where Laura nearly drowns in the rushing creek. It was at this moment when I felt a connection to Laura, imagining the excitement and anxiety the family must have felt when preparing to move…again. Wisconsin, Kansas, back to the Big Woods, Minnesota, Iowa, back to Walnut Grove, and then on to De Smet. Tina and I drove west in a rented Chevy Cruze, past lakes and through wind farms on Buffalo Ridge. Further west into endless prairie dotted with shallow pothole lakes. What would it have been like to cross a then-treeless prairie in a covered wagon? We reached the Ingalls Homestead a mile outside of De Smet, paid $10 each, and explored the land that once had been Charles Ingalls’ claim, now owned by a private family and converted into a living museum. At first, I was worried that the experience would be too commercial, but there were barn cats, and miniature horses, and a wagon ride, and a self-described “Laura whore” who served as narrator and tour guide of the rebuilt Ma’s Little House. 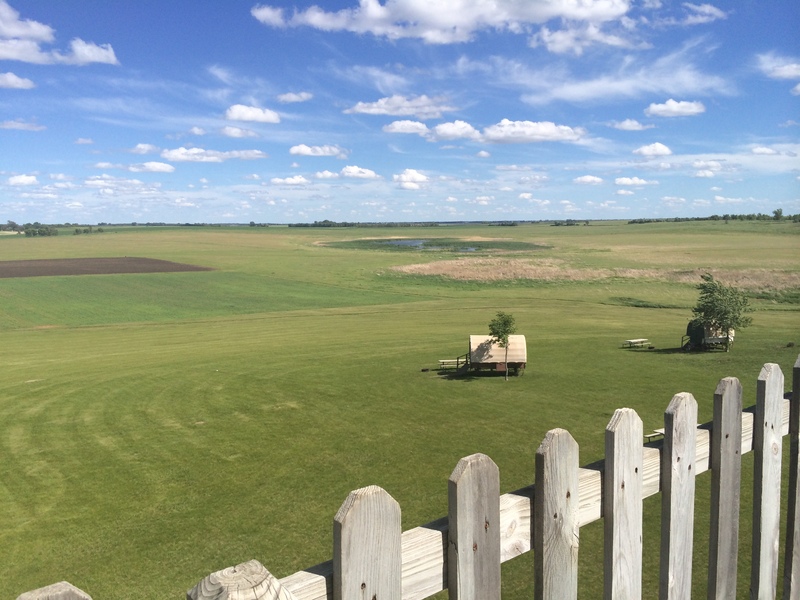 It was entertaining and educational, and the prairie vista was spectacular, so open and endless. We ate dinner at the Oxbow in downtown De Smet and spent the night at the Super Deluxe Inn and Suites. Before turning in, we visited the cemetery to pay our respects to the Ingalls resting there (Pa, Ma, Mary, Carrie, and Grace). Day Four, Monday, June 17th. De Smet to Minneapolis: We had to depart De Smet by 11:00 AM so I could make my 5:30 PM flight out of Minneapolis. We enjoyed a light breakfast at the hotel, checked out, and drove to the other Ingalls’ site, this one with the actual houses where the family had lived. We visited the Surveyor’s House that the Ingalls family stayed in when they first settled in South Dakota (On the Shores of Silver Lake), the school that Laura and Carrie attended (The Long Winter, Little Town on the Prairie), and the house that Pa built after Laura and Almanzo married. 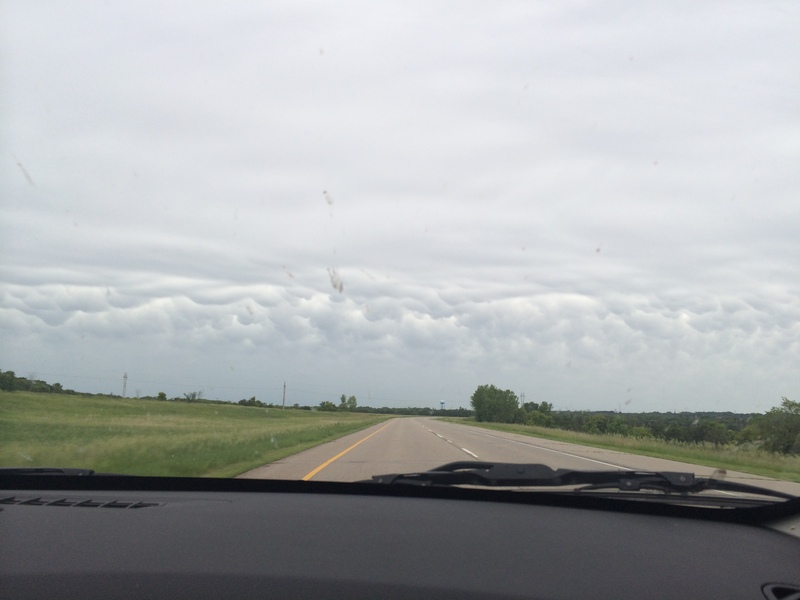 By the time we departed, the sky to the southwest was dark with thick clouds (the edge of the same storm that spawned the twin Nebraska tornadoes), and we said good-bye to the prairie and all its little towns. Across Buffalo Ridge (the wind turbines bright white against the gray sky), back into lake territory (bluffs and woods), and soon we returned to the city. Minneapolis: I wish I had more time to explore this city. Next time! There are plenty of hotels in and around the Twin Cities. I stayed in Bloomington, near the airport and the Mall of America, and there were lots of hotels and restaurants in this area. I had a great dinner at Crave in the mall. Mankato: Mankato is a small city with several hotels. We stayed at the Best Western in North Mankato (indoor pool and good breakfast buffet). We had a great meal (burgers, fried cheese curds, and shandies) at the NaKato Bar & Grill. 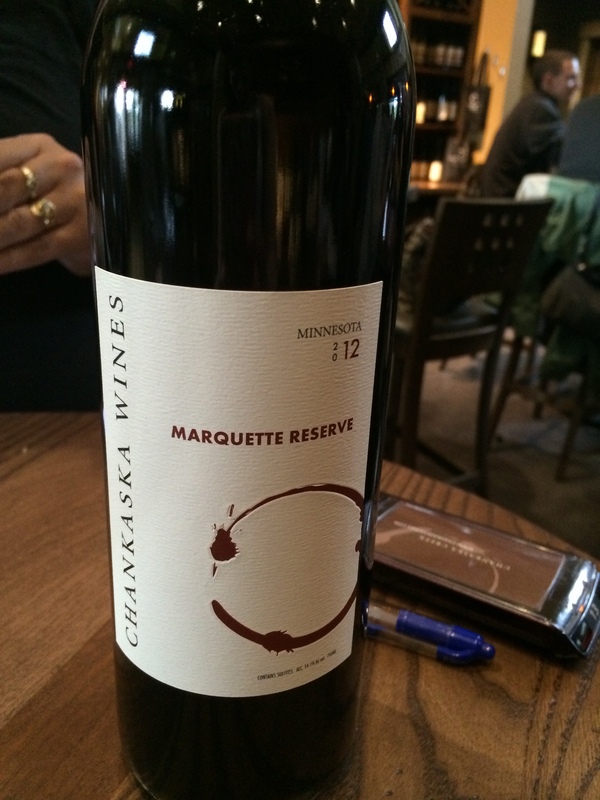 About 20 minutes outside of Mankato is the Chankaska Creek Ranch and Winery. Great wine, gorgeous tasting room, and a delicious tasting menu. De Smet: We stayed at the comfortable De Smet Super Deluxe Inn & Suites and enjoyed dinner across the street at the Oxbow Restaurant (which was the only restaurant open on Sunday night). Some of the nicest people I’ve ever met are in De Smet. Seriously, I love Midwestern hospitality. On the road: There are plenty of fast food restaurants along Highway 14. In smaller towns, you are likely to find a Dairy Queen next to a Subway (we opted for DQ’s $5 lunch special, complete with a hot fudge sundae). Brookings, SD, has a nice selection of larger chains. We grabbed lunch at Culver’s on the way back to the airport. We also stopped at Renee’s Kitchen on beautiful Lake Benton. The Little Houses: Here are the links to the sites we visited along the way, including the Betsy-Tacy homes. * Information about the Ingalls family grave sites, the Wilder homestead claim, and all other things Laura (Where was the Big Slough? What happened to Silver Lake?) is readily available at both De Smet visitor sites. This entry was posted in Life, Reading and tagged Betsy-Tacy, De Smet, Laura Ingalls Wilder, Laura Ingalls Wilder Museum, Maud Hart Lovelace. Bookmark the permalink. Thanks so much, Mother Hen, for stopping by and reading! It was a great journey, and so very rewarding in different ways.